We are off to a tremendous start, with Lot 17, a 3 year old gelding by Martaline selling for €105,000 to J.P McManus on day one of the Derby Sale. This 4 year old gelding, sold by us last year at the DBS Spring Sale for £50,000 won the DBS bumper at Newbury on Saturday. He is in training with Nicky Henderson and was ridden by Barry Geraghty. Well done all connections. Mystery Ocean foaled a filly by Power on Friday night. Don Poli, sold by us as a 2 year old in Saint Cloud back in 2011 continued his winning run today at Clonmel, in the Novice Hurdle. 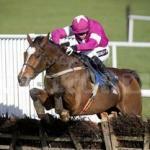 He is trained by Willie Mullins and was ridden by Bryan Cooper. Well done all connections. This 4 year old home bred filly won the Mares Intermediate bumper at Fakenham on 14th Feb in impressive style, by 22 lengths. This was only her third outing, and she has never been out of the frame. Her dam, Empress of Light, is due a Sulamani foal this time. Our homebred mare Collectable foaled a colt by Baited Breath. This is her first foal and our first colt of the 2014 season. This 7 year old, sold by us at Goffs Landrover Sale for €50000 back in 2010, won the 3m 4f handicap chase at Punchestown easily in heavy conditions. He is trained by Conor O'Dwyer and was ridden by Bryan Cooper. Well done all connections. This 5 year old won on only his 3rd outing, this time over hurdles at Thurles last week. Sold by us as a 2 year old in St Cloud, realising €42000, he is now in training with Willie Mullins & was ridden by Bryan Cooper. Well done all connections.